REO’s Migrant Education Program is funded through the Office of Public Instruction’s Migrant Education Program. Through statewide identification and recruitment, the program provides supplemental instructional and supportive services to migrant summer school students, students who travel to the state with their parents for seasonal work, and year-round migrant students living in small, rural communities. Migrant children have specific needs requiring specialized instruction. The nature of migrant work entails moving often which can result in gaps in a child’s education. REO’s Migrant Education Program helps fill in these gaps, giving each child the opportunity to be more successful academically. The program includes the ability to help these students graduate from high school or obtain their high school credentials. We try to show students that they can achieve their goals and dreams. 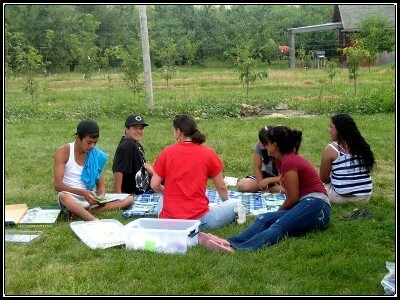 The Flathead Lake Migrant Education Program is the largest Migrant Education summer program in Montana. The program consists of a site-based school program located at Polson Middle School and a tutorial program located in the orchards in the afternoon and evenings. These programs are operated in partnership with the Polson School District. Many migrant students don’t receive the quality education that they should, because of constant movement, language barriers and poverty. The Flathead Migrant Education Program strives to provide an educational experience which helps reduce the effects of educational disruptions and other problems resulting from repeated moves. Computerized instruction is an important component in helping disadvantaged migrant students. Tablets and other forms of technology are used as teaching and learning tools through integration with reading and math lessons. This program is designed specifically with the needs of migrant students, traveling to Montana with their parents, in mind. Project MASTERY, Mobile Access for Students and Teachers to Educational Resources Year-round helps provide many rural schools with new books, games, computers and other quality educational materials. It provides resources for migrant children that these small, rural schools might not otherwise have access to. In cooperation with the Midwest Migrant Educational Resource Center (MMERC) in Minnesota, qualifying schools across Montana can borrow from an extensive lending library of educational materials, including curriculum and instructional resources. MASTERY Instructors travel to the smallest of Montana’s rural schools to identify eligible students and review resources with teachers. Because of the sparse population and agricultural nature of the state, many small Montana schools have students who qualify.